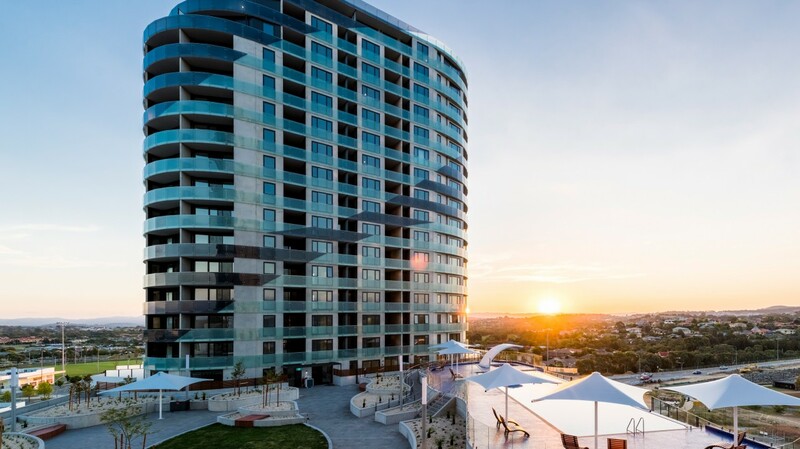 After many years of planning, Geocon and the Infinity team have created Canberra’s highest residential buildings. Located on a risen site in the Gungahlin Town Centre, the 2 towers are comprised of a range of 1, 2 and 3 bedroom apartments with varied floor plan options including everything from 2-storey terraces and penthouses through to 1 and 2 bedroom options. The architectural design that has been developed features an elliptical shape with a band of balconies surrounding the frontage, incorporating glazed glass to allow for solar access. The concept for Infinity was to create a luxury living environment for residents through a combination of quality design, amenities and landscaping. The landscape architecture team at Spacelab wanted to offer a landscaped podium area with a variety of facilities that would be unmatched in Canberra. They aimed to create innovative outdoor garden spaces and resort-style luxury amenities where residents could entertain, relax and be part of a community. The interior design team at Peckvonhartel were tasked with creating interior spaces that would continue this theme whilst allowing the external and internal environments to work together seamlessly. To achieve this, they focused on design outcomes that would integrate the spaces inside and outside, utilising contemporary finishes that complemented the interior colour schemes. Two underlying factors drove the concept for Infinity. Firstly, Geocon’s overall vision of ‘Building Canberra’, their plan to focus on the development of town centres whilst respecting the beautiful established suburbs of Canberra. Secondly, inspiration came from their passion for creating truly unique living experiences that offer quality whilst remaining attainable. Historically, Canberrans have had a preference for living below the tree line. But Geocon set out to challenge this way of thinking, assembling an interdisciplinary team of architects, builders, town planners, social planners and landscape architects to help achieve this vision. Infinity would be a flagship project, where the outcome would revolutionise apartment living in Gungahlin and inform future development in Canberra, influencing the approach to residential apartment living.